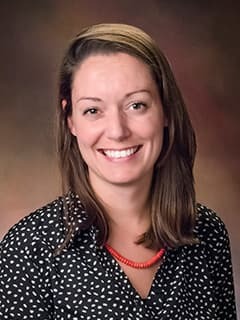 Katie L. Kennedy, MD, is a fellow with the Division of Allergy at Children's Hospital of Philadelphia. Kennedy K, Heimall J, Spergel JM. Advances in atopic dermatitis in 2017. J Allergy Clin Immunol. 2018 Dec;142(6):1740-1747. doi: 10.1016/j.jaci.2018.10.012. Epub 2018 Oct 22. Ruffner MA, Kennedy K, Cianferoni A. Pathophysiology of eosinophilic esophagitis: recent advances and their clinical implications. Expert Rev Clin Immunol. 2018 Nov 3:1-13. doi: 10.1080/1744666X.2019.1544893. Kennedy, K., Grossman, A., Ruffner, M., Spergel, JM., Wilkins, B., Muir, A., Furuta, G., Ruchelli, E., Cianferoni, A., Shuker, M., Brown-Whitehorn, TF. Treatment of eosinophilic gastroenteritis: A multiphasic approach. Poster Presentation, American Academy of Allergy, Asthma and Immunology Annual Meeting, Orlando 2018. Kennedy, K., Abraham, S. & DeFelice, M. “History of Milk or Soy Protein Intolerance in Infancy in Patients With Eosinophilic Esophagitis” Poster Presentation, American College of Allergy, Asthma and Immunology National Conference, Boston 2017. Kennedy, K.; Morsheimer, M. & Cunningham-Rundles, C. “Immunoglobulin Management Approaches in American Patients with Common Variable Immune Deficiency and Autoimmunity” Oral Presentation, American College of Allergy, Asthma and Immunology National Conference, San Francisco, 2016. Pressel, D., Juromski, K., Fingado, E., Tomaszewski, J. & March, P. “Restraint Patient Characteristics” Poster presentation, American Academy of Pediatrics National Conference, San Francisco, 2016. Juromski, K. & Fingado, E. “Systemic Bartonella in an Immunocompetent Patient.” Presented at NYC Regional Pediatric Hospital Medicine Forum, New York City, 2015.